There are some really interesting writers out there and the “Just Thinking” Category is an open invitation to anybody to spend a few moments there, think about the content, and comment as you feel necessary. My life, probably like yours, has had its traumas; successes; failures; celebrations and disappointments. My life, probably like yours, is an ongoing course of learning. This could well be the perfect place for “thinkers” to meet and share thoughts! In today’s busy, stressful world we all need time to take a breather. This book is the perfect thing for that. Sit back and lose yourself for a few moments or longer. Let Colin’s words from his heart speak to your heart. Grab a tissue for some poems and be ready to smile at others, as you find yourself identifying with the emotions brought out in the beautiful poetry. The stunning cover brings peace and that peaceful feeling continues through the pages of this heartwarming book. Mellow observations written while in the midst of unrestful-times. Covers a cross section of experiences over multiple stages of live…I appreciate that sense of ‘circle of life’ perspective. Read this at one sitting or choose bits to read while sipping your favorite beverage. Worth the read as well as the price – especially as a portion of the proceeds goes towards a good cause. Thanks, Colin! Colin has a way with drawing you in and capturing your attention. Talent clearly runs in this family, looking forward to reading more. It can be purchased direct from Friesen Press (link below), and also from all on-line book retailers. It is available in eBook, paperback and hard cover formats. Hope to “see” you again soon. Colin. My dog looks like your dogs twin!! He is.. Our son found him on the street. He is the most affectionate dog we have. He also talks!!! he carries on a regular conversation every night!!! I just wish we could talk “golden/shepherd”!!! Ray is also quite vocal at times and, yes, it would be wonderful to hear them tell their particular story wouldn’t it. By any chance, do you know the about age of Ray. He looks young but by chance could he be shy of 10. I adopted my dog that looked and was extremely similar sounding all the way to the touch sensitivities and emotions, from Aylmer Ontario in October 2008. I think they’re related. Or at least have journeyed the same areas and experiences. His heart forever changed mine. The best thing. 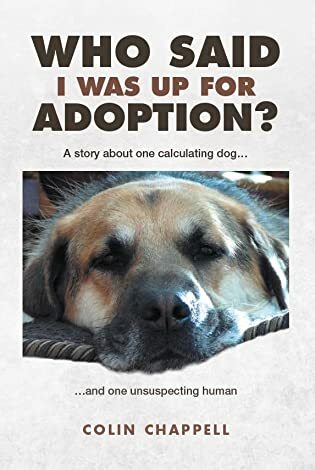 Hi Danielle – Ray’ full story is in his book “Who Said I was up for Adoption?” (see page of same name in Blog) however, to answer your question – He was picked up as a stray in the 9th Line and Upper Middle Road area of Oakville, along with a similar looking dog, in November 2012. Based on the condition of his teeth at that time, he was estimated at 2 years old. Hi Colin and a Hi to your sweet Ray! Hope both of you are doing well.. I had been away and still couldn’t get back to reading the blogs as I used to in the past. Well thank you so much for dropping by and any time you want to initiate a dialogue here, just let me know. For your information, I still have total control over Posts as moderator but, to date, I am happy to say that with over 12 months of blogging behind me, I have only chosen to block 1 Post. Blogging certainly seems to encourage interesting and educational conversations. Absolutely agree regarding the Comments sections. If I never received any Comments, then clearly nobody related to what I was writing, which would beg the question why do I bother? As you are aware, it is really interesting what thoughts and perspectives are displayed in the Comments! I’ll start…your dog photo on your blog banner is irresistible (reminds me of my childhood dog) and the reason I decided to spend my morning commenting on your blog instead of, well, writing. However, I am not alone as a writer with an affliction for procrastination–I heard it’s an inherent part of the occupation. I think this is a great idea — having a special page to expand your blog. You actually have two other pages, don’t you? I’m thinking of doing something like this myself, so let me know how it works for you. I’d be very interested in knowing. Yes…. 3 Pages – Dear Diary, Dog Stories & Just Thinking. Note that the Pages only introduce the subject. Functionality is triggered by the Categories so Page = Category. The only downside is that WP will only allow a Follow by Blog and not by Category or Page however, so far no problems.